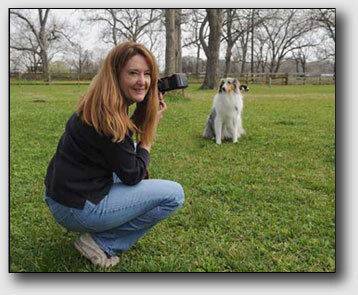 Kathy Adams Clark started teaching others how to take photos back in 1995. Class after class, person after person, Kathy developed a way of teaching photography that's simple and easy to understand. Students give her rave reviews. Track Kathy's professional life at KAC Productions. 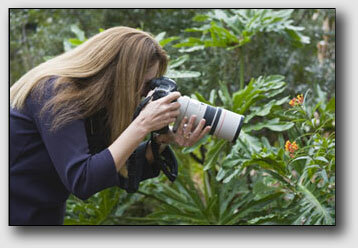 Read her blog postings at Photographing with Kathy Adams Clark and start taking better photos. Digital SLR to point-and-shoot camera to cell camera the principles are always the same. A little information can go a long way! My blog post might help. Is there a continuous light I can use for video or macro photography? I love macro photography but don't own a macro lens. Is there an alternative? Here are some travel photography tips. How do I learn Photoshop? I'm overwhelmed! The basic operations in Photoshop are pretty easy to learn. The key is starting with Bridge and learning how Bridge can improve your workflow. Bridge is a part of Photoshop and we process photos in Adobe Camera Raw. That's another piece of software in the Photoshop package. I don't work on one photo at a time. I have way to many photos and shoot too much to work on one photo here and another there. I have to get the images processed in a hurry. That's why I use Bridge and Adobe Raw Processor. I've created a series of video tutorials to teach you how to use Bridge and Adobe Camera Raw in Photoshop. Watch the videos. Then if you need more instruction join me for a class at My Website. Which digital SLR camera is right for me? I recommend Nikon or Canon camera systems. Any of their cameras are great. Buy the one that feels good in your hands, fits your budget, and has controls that make sense to you. You can start with the lens that comes with the camera. Just be sure you get a Nikon or Canon lens. I recommend something in the 18-100mm range. That's a good range for landscapes, family gatherings, and general photography. Buy a lens in the 70-300mm range for wildlife or sports. Many camera stores and on-line vendors offer deals on the camera body and lens combination. For best results, get a Nikon lens for your Nikon camera or Canon lens for your Canon camera. If you're just starting out, take a look at the MeFoto Globetrotter. There's a carbon fiber model and an aluminium model. This is a great travel tripod. It's strong enough for a professional camera and lens. Not big enough for a super-heavy lens but adequate for most photography. What about a tripod/ballhead combination for more advanced photographers? That's a loaded question because advanced photographers need different equipment for different things. Photographers with big lenses who want light-weight carbon fiber tripods should look at Gitzo GT3530 or 3541. Induro also makes some nice carbon fiber tripods, too. I've used the Arca-Swiss B1 now called the Z1 for years. This is the standard for sturdy, big ball heads. The rival is the Kirk Enterprises BH-1 ballhead that is great for heavy lenses and use. Use the Giotto Rocket Blaster air blower (one with the 7.5" nozzle) first. That usually gets the dust off the sensor. If that doesn’t work, consider sending the camera to a professional. I have sensor cleaning supplies in my camera bag in case of an emergency. The risk of damage is present, though, so I send my cameras out for cleaning periodically. The self-cleaning sensors hold dust off the sensor with technology. There’s still dust in the chamber. Blow the chamber out with the Giotto blower periodically to get that dust out of the chamber. How do I process a HDR image? Here's my BLOG posting about in-camera HDR. How to capture the photos and how the camera processes them. This is another BLOG posting with more detail about taking and processing HDR images. I use Nik by Google to process my HDR photos. How do I buy a camera bag? My latest camera bag is a Think Tank Roller Derby. Great for airport travel as well as moving your equipment from the house to the car. The bag holds two camera bodies, several lenses, flash, and a 15-inch laptop.